of radio controlled modelling, and loosely related paraphernalia. Is 2.4GHz Suitable For Marine Use? I hardly consider myself an expert in the art of boat building, or even particularly competent! 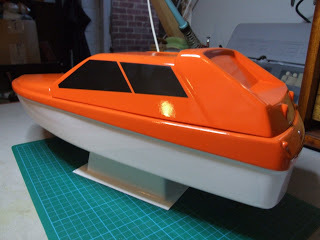 So when I was looking for a boat kit, I felt the need to start with something cheap, and easy to build. Enter the Model Slipway Club 500. It's been around for quite a few years now, and has become established as an entry level racing class at a couple of clubs, my local club included. The Club 500 is a cheap, easy to build, medium performance model racing boat. Construction rules are quite strict, which ensures a competitive race. In terms of running gear, the Club 500 uses a stock fan cooled 550 motor, a standard 7.2v NiCad racing pack of up to 2000mAHr capacity, and a M5 40mm prop. Mounted the battery tray on velcro strips, so that the weight of the battery could be moved forward and aft an inch or two, to try to trim the hull in the water. Reinforce the hull seam at the bow, using a couple of additional strips of styrene. Cut the deck, such that access to the hull is via a removable hatch. The hatch is then secured with insulation tape, to keep the water out. As a few people have commented previously, the design of the deck to hull join is less than ideal. The instructions call for epoxy resin to be used, however I've used Evo-Stick Nail & Seal. Fitting the wing/flying bridge caused a bit of a dilemma. The wing and engine moulding are the only two mouldings that are not required by the construction rules. In this case I decided to fit the wing in the forward swept position, and contruct a blanking plate to finish off the hollow in the rear. This is all additional weight, so it may well get reviewed after a few races. Secure the superstructure with Velcro instead of the mounting pegs, and I did not drill out any drain holes. Both of these in an attempt to keep the hull watertight. After a couple of test runs I found that the Club 500 was taking on some water through the rudder tube. However after packing the rudder tube with a little grease this was reduced to a barely noticable level. Other solutions I have picked up to prevent the water ingress, including using a washer or silicon tubing at the top of the rudder post. Currently I'm using a cut down rubber grommet. Overall it's been a fun build, and is fun to race. The Club 500 performs well with a respectable turn of speed, but I definitely think the skipper needs more practice! Finally you can see the Club 500 class in action at my local club, the Southend Model Power Boat Club (http://www.smpbc.co.uk).